Noticed frank had posted this in response to someones questions about the bluesberry mod for the hotcake. When i compared the schematic to the hotcake i noticed a few differences so I thought it would be a nice addition and variation to have on the site. The only addition to the schematic I mad is I added the typical 1M pulldown resistor to prevent any switch popping. I believe you need to reverse the orientation of the diodes, otherwise D2 will always be conducting. See my follow up comments. Thanks! cool. just saw the post and fixed the diodes. i listed to the hotcake and its a nice OD, and some of the psych bands i really like and have seen live use it. 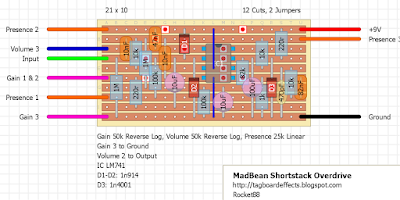 i think some of the value changes in the madbeans version will make a significant difference in tone. so will be worth doing. Just made this, works a treat! I used 240r resistors in place of the 220r. Unfortunately I don't the right reverse log pots, I used linear which has made those controls effectively useless but it still sounds sweet with the gain dimed. Cheers! awesome. how does it sound compared to the hotcake demos? i'm super curious since there are no demos for this, well at least any that i could find. Well I don't think I can be much of an authority on this but from what I can tell it sounds very hot cakey. I need to wait until my next tayda order arrives before I can really judge I t in its full glory. Also for the record I used a TL071. Built this using a 741 and it sounds really good. I also had to use linear pots for the vol & gain but will rectify soon. is D2 already reversed or is the schematic OK now? hey jochen. the layout matches the schematic and is verified. if you built it and it didn't work there's got to be a build error somewhere. post the problem and some pictures of your build in the debugging section on the forum. I´ll Post a Pic of the finished Pedal as soon as possible. no worries buddy. the important thing is it's working and you're happy with the build. just remember if you're ever having a problem where to post about it so someone can try and help you out. Where does it goes the volume 1 lug? I just leave it without conection? Goes to ground. It should be in the notes, I'll fix it later. What's the job of the 100uf electrolytic cap in this build? I've noticed some hotcake layouts have it, while others do not. Could it have something to do with the oscillation problems some are having with this circuit? The 100uF is for power filtering. I'm not sure what oscillation you're talking about, there's not issues with this layout. If the 3pdt switch with LED is wired such that the input is grounded in bypass, is the 1meg pulldown resistor required? Thanks! The pulldown resistor is used to reduce or eliminate (hopefully) the popping you get when you switch on and so are breaking that connection to ground. So yes you still require it, unless you get no popping of course, but you'll need to experiment with that yourself.